In many instances, individuals and couples who owe student loans can still qualify for a mortgage. One way lenders calculate whether you can afford a mortgage loan is by looking at how your total debt would compare to your current monthly income. This is known as your debt-to-income (DTI) ratio. Most lenders use a DTI threshold of 36%, meaning your payments on your debt, including student loans, credit card debt, and a mortgage, should be less than 36% of your total monthly income. For instance, if your total income each month is $5000 and you make payments of $250 each month toward your student loans, your current DTI would come out to 5%. A mortgage would increase that significantly. If you take 36% of your monthly income of $5000, your threshold would be $1800 each month. 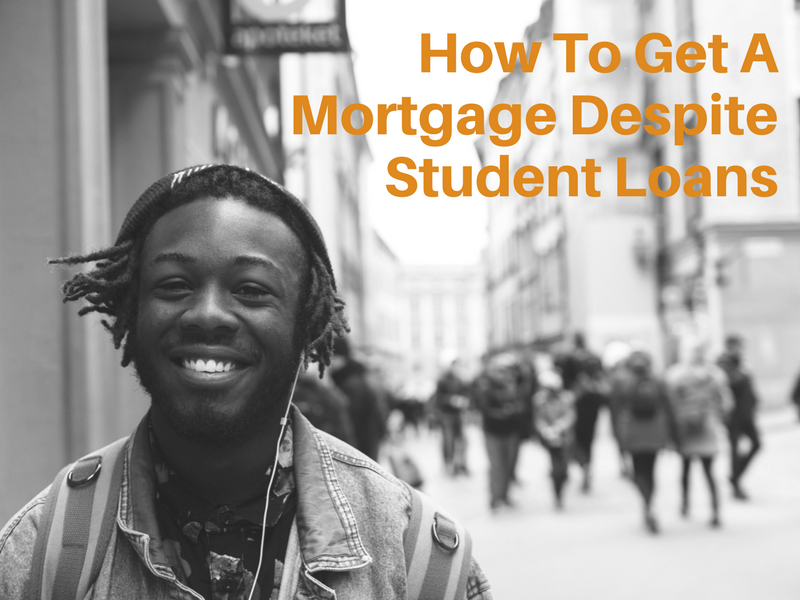 Subtract from that your student loan payments of $250, and you have a maximum $1550 you can dedicate toward a mortgage, which is often more than sufficient for a home. In many cases, your student loan payments won’t be quite as significant as you might think when it comes to affording a mortgage. However, in cases where finances are especially tight, it can still be a deciding factor. Every little bit will help in those scenarios. Another aspect of your financial profile that lenders look at when considering whether you qualify for a mortgage is your credit score. This is essentially a measurement of how reliable you are when it comes to repaying debts, such as student loans and credit cards. The better you are at keeping up with those payments and making them on time, the higher your credit score will be, which can be a good thing for college graduates with student loans in repayment. Even if your DTI ratio isn’t ideal, you might still qualify for a mortgage if you have especially good credit. While payments may be a bit more difficult to manage, you’ll have shown that you are consistent with making payments on time and avoiding default on your debts. Some lenders may be willing to make an exception in these cases, so it’s useful to ask around. In cases where your student loan debt tips the scale on your DTI ratio, one option that may be available to you is to refinance your student loans through a private lender. This can get you a lower interest rate, thereby reducing the proportion of debt you have compared to your monthly income. If your debt-to-income ratio simply cannot fit below the threshold, you may want to consider making a higher down payment. Putting up more upfront will not only reduce the total amount of debt you owe on your mortgage—thereby reducing monthly payments—but it will also increase the odds of approval even if you don’t quite get below the 36% threshold. In particular, borrowers who make a 20% down payment on their mortgage are very rarely turned away since they have already made a large financial commitment toward their investment while also eliminating the need for private mortgage insurance. Over time, combining all of these can help you save thousands every year that you can put toward a down payment. In most cases, lenders don’t maintain mortgages themselves. Instead, they sell them to entities such as Fannie Mae, which is the main reason why there are so many restrictions and requirements set for these types of loans. 1%, which could be sizeable). Non-mortgage debt that is being paid by someone else, such as an employer or your parents, may now be excluded from DTI calculations. In addition, Fannie Mae is now more lenient when it comes to DTI requirements, potentially allowing ratios above 45%. This means lenders are more likely to approve applicants who have a less-than-ideal DTI ratio since Fannie Mae is more willing to purchase them. If you’re repaying student loans, purchasing a home may still be an option. This is especially true if you have strong credit, are able to make a solid down payment, and avail yourself of outside assistance and recent changes in policy.